GLENDALE, Ariz. — Quarterback Sam Bradford was well aware of David Johnson even before signing with the Cardinals in the offseason. Bradford was on the opposite sideline when Johnson rushed for 187 yards and three touchdowns while trouncing Bradford’s Eagles in 2015. A training camp with Johnson has only amplified Bradford’s appreciation. New coach Steve Wilks and new offensive coordinator Mike McCoy are expected to do exactly that, although it might not be evident in the Cardinals’ preseason opener against San Diego on Saturday. Johnson, who was second in the NFL with 2,118 yards in total offense in 2016, was injured in the 2017 season opener against Detroit and hasn’t played since. He understands the preseason plan. Johnson’s focus in training camp, which he opted to attend after sitting out the mandatory offseason workouts in June because of a contract dispute, is to get in sync with McCoy’s playbook. Johnson’s emphasis now is on learning the nuances of the new running game, although it is safe to assume his pass-catching ability will be utilized as it was in 2016, when he had 1,239 rushing yards on 293 carries and 879 receiving yards on 80 receptions. 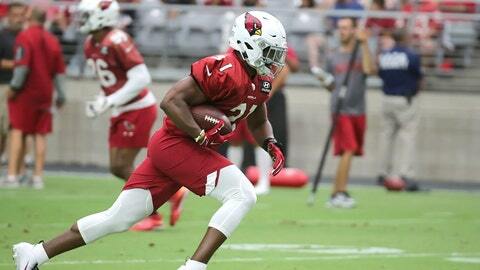 While Johnson will be the feature back, the Cardinals will use other packages that could involve Edmonds, Foster and others depending on the opponent’s defensive schemes, Wilks said.